On February 16, 2019, His Holiness Patriarch Mor Ignatius Aphrem II participated in a Panel Discussion at the Munich Security Conference 2019. The panel was organized and sponsored by Hanns Seidel Stiftung Foundation, and was entitled: “Dawn of a new era? Future Perspectives for Religious Minorities in the Middle East”. 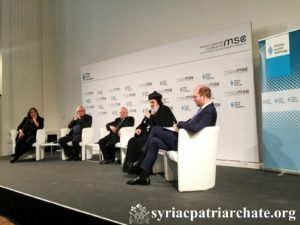 During his contribution, His Holiness spoke about the persecution of Christians in the Middle East, as well as the general situations in Syria and Iraq. His Holiness highlighted the negative impact of the sanctions on the Syrian people. He also raised the case of the abduction of the two Archbishops of Aleppo Mor Gregorius Youhanna Ibrahim and Boulos Yaziji. His Beatitude Cardinal Mar Louis Raphaël I Sako, Patriarch of Babylon of the Chaldeans and head of the Chaldean Catholic Church, and His Excellency Volker kauder, Former German Interior Minister, also contributed in the panel.